After an initial unsolicited $47 billion bid, the Valeant Allergan offer will be sweetened, Valeant Pharmaceuticals International Inc. has announced. Pershing Square Capital, an activist Allergan shareholder, says it will seek a non-binding vote as pressure mounts. Making a move to acquire Allegan Inc., the firm that owns the trade names Botox Cosmetic and Vistabel for the treatment of wrinkles, is the largest acquisition attempt so far by Canadian company Valeant, which last year bought the eyecare firm Bausch & Lomb Inc.
Valeant’s initial bid consisted of a cash-and-stock offer valued at $45.7 billion in which Allergan shareholders would receive $48.30 in cash and 0.83 of a Valeant share for every Allergan share they possess. The unsolicited bid is supported by Pershing Square Capital Management, Allergan’s largest shareholder. Allergan believes it has a better future by going-it-alone. Valeant’s CEO, Mike Pearson, says he wants his company to become one of the big five global pharmaceutical multinationals by 2016. He has spent $19 billion acquiring firms since 2008. Mr. Pearson says he will not stop his pursuit until Allergan shareholders inform Valeant directly that they prefer Allergan’s go-it-alone course to a future with Valeant. While emphasizing that it will remain “financially disciplined”, Valeant says it is committed to succeeding in the takeover. According to documents filed with the Securities and Exchange Commission, Pershing Square says it is going to ask Allergan stockholders to attend a meeting and vote on forcing the board to talk to Valeant. The vote would be non-binding. Allergan says it expects to raise earnings per share by between 20% and 25% and achieve double-digit growth in 2015. Over the next five years it predicts double digit sales growth and 20% compounded annual growth of earnings per share. 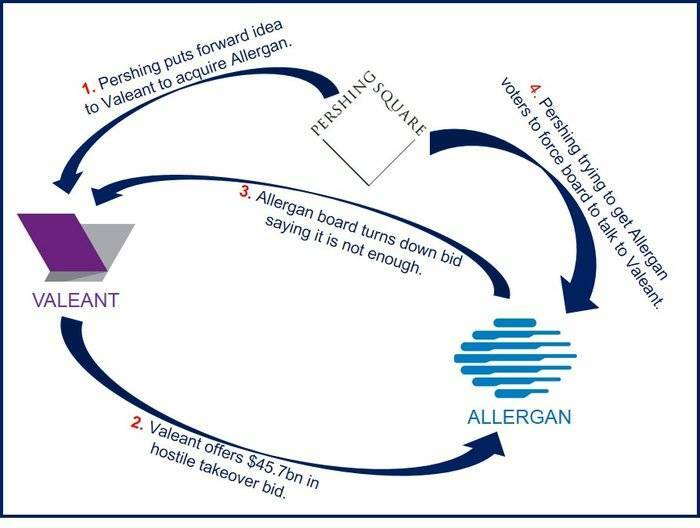 Update: June 11, 2014 – Allergan rejects Valeant’s improved $53 billion bid. Pershing Square Capital Management founder and CEO, William Ackman, says there is now no choice but to take the offer directly to shareholders. Valeant and Pershing say they will try to replace Allergan’s board of directors.